It is now more than three years since the Expert Panel set up by the Gillard Government reported on how the Constitution might be amended providing recognition of Aboriginal and Torres Strait Islander peoples. The Abbott Government has been waiting for some consensus to emerge around the recommendations of the panel. Progress has been slow. No one thinks it realistic to seek a constitutional amendment during the life of this Parliament. The best to be hoped for is a commitment by all major political parties to an agreed referendum question when going into the next federal election, with the understanding that the new government and the new parliament would proceed to put a referendum to the people, perhaps on Saturday 27 May 2017, the fiftieth anniversary of the successful 1967 referendum. Prime Minister Abbott says he is committed to completing the Constitution, rather than changing it. There will be no amendment to the Constitution unless a broad cross section of Indigenous leaders seek it. It has been in response to Indigenous misgivings about the existing constitutional provisions that our political leaders have been prepared to consider amendments to the Constitution. No referendum will succeed unless the majority of Australians are convinced about the necessity, correctness and certainty of the proposed amendments. At the moment, ‘the outdated notion of race’ appears in two constitutional provisions. Section 25 is a provision which has never been used and never will be. It is modelled on one of the post-civil war amendments in the US Constitution penalising states which exclude people from voting in state elections on the basis of their race. Everyone is agreed that section 25 could be simply repealed. Section 51(26) provides that the Commonwealth Parliament can make laws with respect to ‘the people of any race for whom it is deemed necessary to make special laws’. That section could be replaced with a new power to provide that the Commonwealth Parliament can make laws with respect to ‘the cultures, languages and heritage of the Aboriginal and Torres Strait Islander peoples and their continuing relationship with their traditional lands and waters’. The art and statesmanship of constitutional change is in matching Indigenous aspirations, constitutional architecture, and public support. The key provisions of the Constitution cannot be thrown out of kilter. Our Constitution is still an appendix to an Act of the Imperial Parliament. It is a monarchical, not a republican, Constitution. It does not include a bill of rights. It prosaically lists the powers of the Commonwealth Parliament. The Imperial Act contains an old worldly preamble; the Constitution contains no preamble. Anyway, a constitutional ban on racial discrimination is not as simple as it seems. When legislating for native title in 1993 and 1998, the Keating and Howard governments were unable to agree to the demand by Indigenous leaders that all provisions of the Native Title Act be strictly subject to the Racial Discrimination Act. In the Senate, the Democrats and Greens had proposed such an amendment but the major parties, in government and in opposition, agreed to oppose it because of its ‘so-called clause busting capacity’. Anyone serious about a constitutional ban on racial discrimination should first clear the decks by trying to convince the major political parties to amend the Native Title Act as previously suggested by the minor parties. They would first need to convince the Business Council of Australia, the National Farmers’ Federation, and the Minerals Council of Australia to agree to native title amendments which previously were thought to put in doubt future pastoral and mining activities. Without these precautions, a constitutional guarantee of non-discrimination would be a clause buster of nuclear proportions. It’s just not on. It’s time to learn the real lessons which followed the 1967 referendum. That referendum kick started the change from terra nullius to land rights, and from assimilation to land rights. Prime Minister Harold Holt appreciated that a modest referendum carried overwhelmingly provided the political mandate for policy changes. The catalyst for change was the Council for Aboriginal Affairs which he then set up to advise government and to engage daily with public servants and politicians when considering policy and administrative changes. Any modern equivalent would not restrict its membership to ‘three wise white men’ even of the eminence of Dr HC Coombs, Professor WEH Stanner and Barrie Dexter. Noel Pearson is right to insist that Aboriginal leaders need a place at the table when new policies are being formulated. An Indigenous council is needed to advise government. Coombs, Stanner and Dexter constantly lamented that they lacked a statutory charter setting out their role and responsibilities. Any new council would need a clear legislative mandate. But there is no need to tamper with the constitutional architecture, seeking the inclusion of such a council in the Constitution. Indigenous representation is always a fraught exercise. At least in the first instance it would be impossible to design a constitutional provision for a Council which was technically and legally sound, ensuring the untrammelled sovereignty of parliament. Our Constitution unamended makes no mention of Aborigines and Torres Strait Islanders. It is premised on the outdated notions of terra nullius and assimilation. It is time to modernise the Constitution, eliminating the outdated notion of ‘race’ and including an acknowledgment of the nation’s Indigenous heritage and ongoing identity. This is no small change. But it is a change which is necessary, correct and certain. Indigenous leaders may want to delay such incremental change, convinced that more substantive change might be achievable in future. That is surely their prerogative. But should they seek constitutional inclusion now, an Acknowledgment and a Commonwealth power to make laws with respect to the matters acknowledged would be a principled, safe way forward to complete our Constitution. 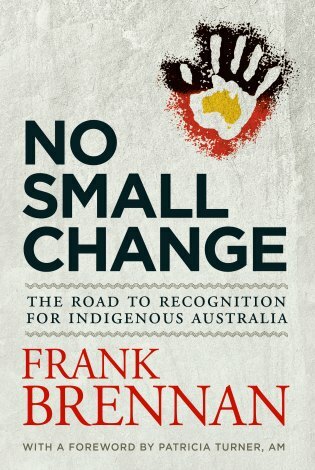 Frank Brennan is the author of No Small Change: The Road to Recognition for Indigenous Australia (University of Queensland Press). This piece first appeared in The Weekend Australian, 16-17 May 2015. "No Small Change" is a book I'm interested to read so a visit to my bookshop to put in an order is in order. Indigenous people make up just 3% of Australia's population, an extreme minority, and this surely is part of the reason constitutional recognition is so slow in coming. Indigenous peoples themselves have to reach agreement on strategies for the way forward, no easy task either. Not only a place at the table, but a place of respect and recognition of the barriers in force, is important for indigenous peoples. Constitutional recognition based on indigenous flourishing - that's a dream worth fighting for. Thank you Frank for another great article. Also listened with interest to your interview on Radio National this morning. I have to say, I thought to myself, why is this difficult? Just make our constitution fair and give our Indigenous people the recognition they deserve. However, as I read your article and others about the complexities of the law, I am learning nothing is simple. That said, we have to start somewhere and we need a clear and concise referendum by 2017, which is both air tight and acceptable to Indigenous and non-Indigenous Australians. I would hate to see this go on for another 10-20 years. Thank you for the article Fr. Frank. Maybe it was in some ways the fault of the Aboriginal supreme being (God), The Land, that denied the Aboriginal people justice in the takeover of The Land by the English "superior beings". Unlike the New Zealand Maoris who defeated the English in a few wars and managed a treaty to their advantage which curtailed total English power in their land, the Aboriginal people were defeated by the tyranny of distance, the signature of this land, which denied the union of Aboriginal people, the vast majority of whom were remote from Sydney Cove. It took the disease ridden English occupiers with their superior weaponry some 12 years or thereabouts to militarily defeat the local Aboriginies of the Sydney region lead by the courageous Pemulwuy, admired for his bravery in Governor Phillip's despatches to London. The time is long overdue to abandon the British injustice and get the treaty sorted to the mutual benefit of today's citizens, (nay, brothers and sisters) in this sad, diverse family we call Australia. The Aboriginal recognition is another case of 'for the show' for the outside world. We still do not have a Bill of Rights and so as a minority, we have no protection and no recourse in the Australian law. International law does not form part of Australian law until it is enacted in Australian law. Australia can only legitimise protection and equality for all when they legislate and give all including us our human rights and when our parliaments and industries reflect the demography of Australia and confirm the true Australian identity. The Australian parliament legislates values, way of life, how one interacts with another one. No one is born hating another person because of the color of their skin or their background. The government continues to build policies and platforms from a one sided Anglo Celtic Saxon base poisoning the mind of the backward, the bigoted and the prejudiced. Political subordination and token 'yes' men aside, diversity in the parliament is the difference between inequality and equality in this nation, especially for us dark skinned professionals on the ground. We have no voice. The lack of human dignity all dark skinned peoples continue to experience in Australia is a direct result of the white supremacy policy. Democracy and human rights go hand in hand. Why don't you consider writing a book on that? No, we are not convinced about this aboriginal recognition. I think it important to make another point. The Australian Catholic Church authorities has warped the concept of Christianity in Australia to cloak the abhorrence of racism in it. I am reminded of Fr Steven Scheier who had a near death experience in the USA and recounted that God condemned him to hell as God said he had been a priest for himself and not for God. http://m.youtube.com/watch?v=L1xFfFy0PlM We are so tired of the coverups and false teachings in the Australian Church as also highlighted in Fr Ted Kennedy Australian book, "Who is Worthy, The role of conscience in restoring hope to the Church" in Australia. Power and authority must be balanced with accountability. Why doesn't the Australian Church leaders take accountability? You only have to look at the David Ridsdale case regarding Pell. When are we going to get a truly, holy Catholic Apostolic Church in Australia? - how many millions of souls have died over the decades and continuing...Its wrong! Wrong is wrong even if the majority is wrong and right is right. And for those Australian Catholics whose teachings have been misinformed - when Aboriginals or anybody for that matter are baptised in the Catholic faith, we are all equals. I thought I would include the true Catholic Church teaching: "In the Church there is equality, because once baptised we are all equal, all children of the same God, our Father. There is no difference as Christians between the Pope and someone who has just joined the Church. But this radical equality does not mean that we can change the constitution of the Church in those things that were established by Christ. By expressed divine will there are different functions which imply different capacities, an indeliblecharacter conferred on the sacred ministers by the Sacrament of Orders. At the summit of this order is Peter’s successor and, with him, and under him, all the bishops with the triple mission of sanctifying, governing and teaching. Forgive me for being so insistent, but I must remind you again that the truths of the faith are not determined by majority vote. They make up the depositum fidei: the body of truths left by Christ to all of the faithful and entrusted to the Magisterium of the Church to be authentically taught and set forth. It would be an error to think that since men seem to have become more aware of the bonds of mutual solidarity that unite them, we ought to change the constitution of the Church as if it needed updating. The times do not belong to men whether ecclesiastics or not. The times are God’s, who is the Lord of history. And the Church can bring salvation to souls only if she remains faithful to Christ in her constitution and teaching, both dogmatic and moral." When are we going to get a truly, holy Catholic Apostolic Church in Australia? A couple of questions, Frank. Firstly, why not repeal both sections 25 and 51(26)? Do either serve any purpose anymore? Secondly, how can one write a 'preamble' to something that was enacted a century ago? What is being proposed would be better called a 'postamble' or 'after thought', which makes clearer the hypocrisy underlying this whole attempt at providing a Clayton's version of recognition. Sorry Frank most Australians, accepted 'Aboriginal' included, do not understand the purpose of the so called recognition of,or for, the 'Aboriginal' peoples. What is the gain? Is it just window dressing or will there be presents in the stocking. Many of us are now 5th, 6th even 7th generation Australian. I wonder when does one become Aboriginal to the Land or is it really just a race and colour thing? Like the policy struggles of the present government constitutional change will never be accepted until you tell us why we need it. You haven't done so in this article.